I'm not sure how many people actually make porcupines, or how popular they are, but I really thought this little guy was cute. It also involves using a fork for painting which I thought was a bit different. Pour small amounts of tempera paint into some dishes. I used small paper plates. I also used large plastic forks(not the small kind) to paint with. I had a different fork for each color. 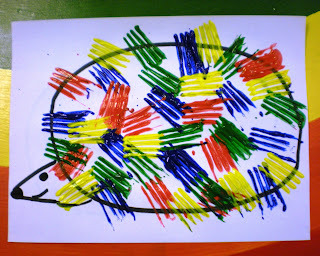 On the piece of construction paper draw a large oval, this is the porcupine's body. Near the lower part on one side of the oval, draw a triangle for the porcupine's head. Add an eye and color the point in for the nose. Dip the fork into the desired color and press on the paper. This took me a little while to get right. If there is too much paint on the fork you just get a blob. Also, I found rocking the fork instead of just pressing gave a good impression. 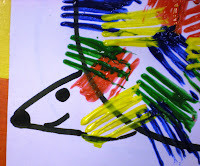 Keep adding colors until you have a prickly porcupine. If you notice, I added my head last. This was a bit tricky with wet paint. You might want to wait until the paint dries. Or, you could add the head first, but I think you take the chance of that getting very prickly too. Ironically, when I was writing this yesterday, I noticed that The Bookworm's Booklist had an adorable porcupine story showcased. How helpful! You might want to check it out. That is stinking cute! And I love the idea of painting with a fork. I agree with BranFlakes. So cute and what a fun idea-to paint with a fork! Thanks for sharing...I just love it! And thank you for sending your readers my way!!! That is adorable! Great idea like always!!! Can that project be any cuter? Seriously, that is the cutest porcupine ever! I will definitely be copying you! In all my years of making animals during art time i have never made one, I can't wait to make one with my son - with a link of course!! 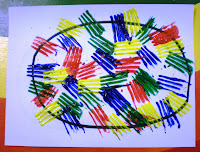 You could also buy plastic forks, break off the prongs and add them to the painting to make the porcupine 3-D.